I would pace at three in the morning. "I'm going to lose this house. My kids are going to switch schools. I have three months to live. I'm going to lose this house. I'm going to this and that and this/that." The chatter doesn't stop, and it's nightmarish at three in the morning. And at four, and at five, and it doesn't stop when the kids wake up and they don't know anything is different but I cry then because everything is different. Because the house is a prison. Because my head is a mental asylum. Ideas. Find your "customers." Treat yourself like a one-man business. Make a list of customers (i.e. places or people you might want to work with) Then come up with a list of 10 ideas for each customer/place you might want to work. Ideas that can make them money. This way you keep your idea muscle intact. Don't let your idea muscle atrophy! Pitch your ideas to that customer if you can. If you can't , move onto the next customer. But wait until tomorrow. You did your thing for today. Be proud. THIS TECHNIQUE WORKS. It's worked for me. Slash. Make a list of all expenses you can slash. Make your runway as long as possible. There are plenty of sites to advise how to do this. Picture your worst-worst case scenario. It's never as bad as you think. Write it down. Write down the plan for the worst-case scenario. Then take a nap. You just had a hard day. You need to rest. Write. Write a book in the next three days. You can write a 30 page book about dieting ("100 ways to Lose 100 pounds") and put it on sale on Amazon in one day. Why not? The traditional book industry is over. 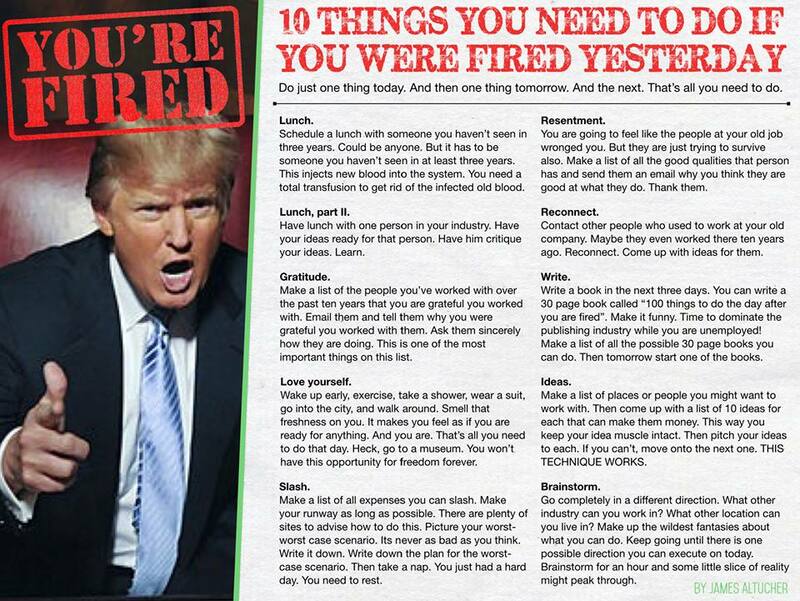 Write the book "100 things to do the day after you are fired". Make it funny. Time to dominate the publishing industry while you are unemployed. Today make a list of all the possible 30 page books you can do. Then tomorrow start one of the books. I have one friend who just self-published a book. He was dead broke before that after being fired from his job. He made $100k in 90 days. No joke. This was about a month ago. Brainstorm. Go completely in a different direction. What other industry can you work in? What other location can you live in? Make up the wildest fantasies about what you can do. Keep going until there is one possible direction you can execute on today. Brainstorm what blog you can do (and what products you can sell on the blog). Brainstorm about photography (anyone need a photographer this weekend?) Brainstorm about ecommerce (check out penny auction sites where you can buy stuff for pennies and resell on Ebay). I don't know. I'm making stuff up. But brainstorm for an hour and some little slice of reality might peak through. If you are feeling better, go for the full Daily Practice. But don't stress it. The Daily Practice has always worked for me when I've hit my low points on repeated occasions. But first do "one thing a day". No pressures. 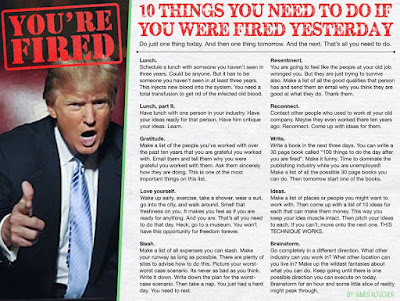 And anyone who was fired yesterday, March 10, feel free to call me anytime to chat. Contact me first thru the email on this site, leave me your number, and I will call you. Corporate stability has always been a myth. But entrepreneurship and risk is also a myth. We were never without risk. Risk is life. But now you are forced to embrace it. The good thing is, sometimes embracing leads to love. James Altucher has written five books on investing, started and sold a few companies and runs a small VC fund. Lost all his money, made some back. Repeated that adventure a few times. Now tries to live a simple life. Writes at jamesaltucher.com and you can find him on twitter at @jaltucher.